In the past few quarters, TCS, India’s largest software services exporter, has closed the gap with North America leader Cognizant on growth in revenue and profit, said a report by brokerage firm JPMorgan on Wednesday. “The revenue/gross profit/Ebit (earnings before interest and taxes) year-on-year growth differential between Cognizant and TCS has narrowed reaching perhaps the lowest level in a decade. “Except for the US, where Cognizant has now emerged as the largest offshore IT services player, TCS has pulled ahead in Europe and rest of the world,” said the report. Image: Tata Consultancy Services Chief Executive N Chandrasekaran speaks during a news conference in Mumbai. It said, while Cognizant had added more incremental revenue in the US than TCS because of its ‘focused business model’, TCS had positioned itself as a more end-to-end and ‘broad-based’ player. The report said the gap in revenue growth between Cognizant and TCS had reached to its lowest of four percentage points in the four-quarter period ended September, ‘despite TCS’s larger revenue base’. In the corresponding period of 2010, the revenue growth difference was 13.7 percentage points. 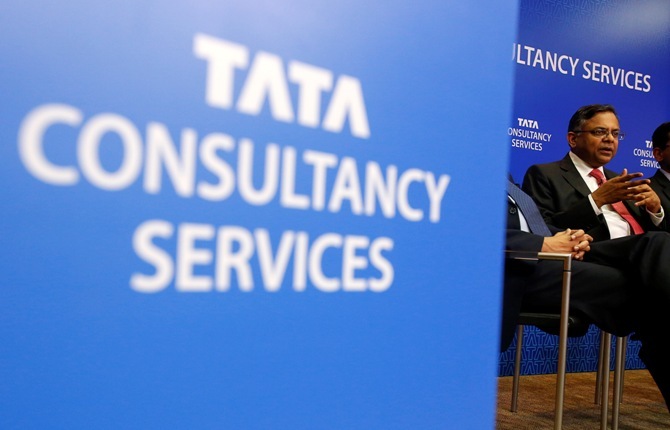 By gross profits, TCS has, for the first time, overtaken Cognizant in the 12-month period ended September, while it has narrowed the gap in operating profit to five percentage points. 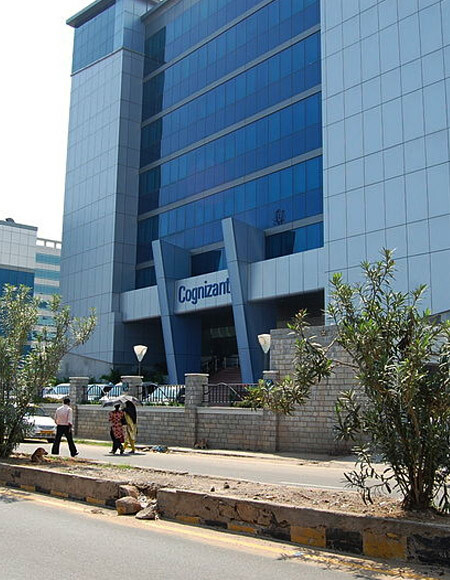 Image: Cognizant Technology Solutions building at Chennai. “Cognizant’s EBIT growth for the 12-month period ended September is only 5 per cent higher than for TCS; the fact that TCS has closed the percentage EBIT growth gap significantly at much higher margins makes TCS’s performance all the more creditable,” the report observed. However, the report found that Cognizant’s per employee revenue contribution continues to be higher as compared to TCS, owing to the former’s exposure to high-value services such as consulting and enterprise resources planning. For the four-quarter period ended September this year, the revenue per employee at Cognizant stood at $53,000, ahead of TCS’s $46,000. 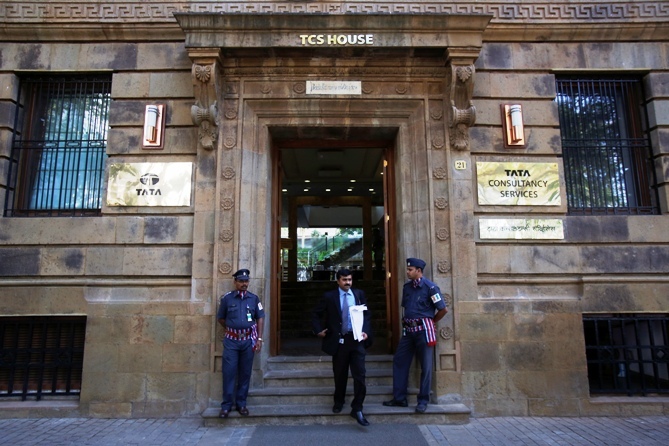 Image: A man walks out of the office of Tata Consultancy Services in Mumbai. The per employee revenue contribution gaps between both the companies stood at $4,000 in 2012 and $3,000 in 2011. “We think this is attributable to business and geographic mix. Cognizant is more exposed to discretionary/higher per capita service lines such as consulting and ERP,” it says. TCS, on the other hand, has a greater exposure to offshore-centric lower per capita offerings which are scalable such as BPO, infrastructure management services, the report authored JPMorgan analysts Viju K George and Amit Sharma added. The report also said Cognizant had been immensely benefited because of its focus on North America, which accounts for 78 per cent of its overall revenues. 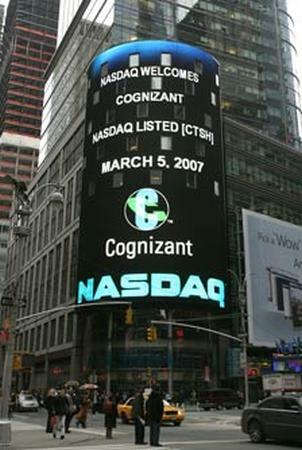 Image: Cognizant logo on display on the NASDAQ headquarters in Times Square. Year after year, the Nasdaq-listed company has been adding higher incremental revenues in North America than TCS. However in Europe, even though Cognizant seems to be rebounding after minor setback in FY12, the incremental revenue addition by TCS in the last 4 quarters is ‘still much higher’. In incremental revenue addition from the rest of the world (ex-North America and Europe), TCS is `well ahead of Cognizant’. “It (Cognizant) has consistently driven greater incremental revenues from the US than TCS. “TCS, on the other hand, is a far more diversified play for whom resource allocation and business focus is not as concentrated in the US as is for Cognizant,” the report added. 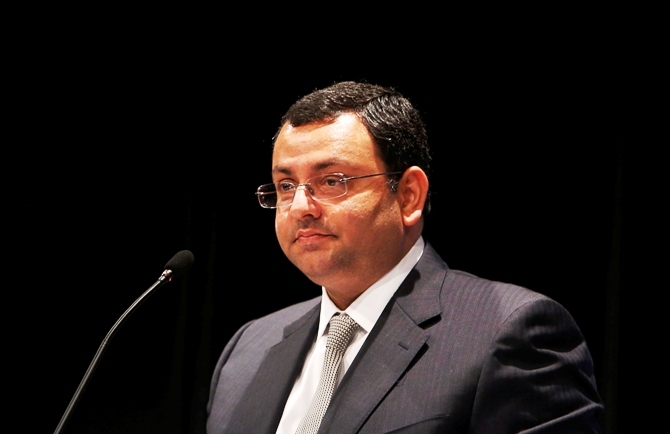 Image: Tata Group Chairman Cyrus Mistry speaks to shareholders during the Tata Consultancy Services annual general meeting in Mumbai June 28, 2013. Is Cognizant's dream run OVER?